If you have decided to self-build your new home, you will have made the decision to design the entire house yourself, or complete at least some of the design with the assistance of a professional designer. Vision enlist the assistance of trusted architects who have assisted with drawings as well as planning permissions and building control. Above is a 3D Design we had created for the new build home we built and sold in Whitchurch Hill along with an image of the completed house. If you can envisage your new home and have spent time visiting the site of your proposed build, taken into account the size of the plot, neighbouring properties, if there have been any planning applications previously or if there are trees to consider. Take a read of our recent blog on pointers to look out for when choosing your self-build plot. If you aren’t confident to look after all the drawings required for your new home (planning permission & building regulations) then you can enlist the help of a qualified designer at this stage to oversee what you have submitted and also compile building regulation drawings taking into account the more technical aspects of building. You may be interested to look through the kit homes we have available to purchase which will include within their packages all the drawings required. Developing a design brief for your new home will be crucial as this will identify what you want from every aspect of your new home from room positions and sizes to the styles and materials you’d like. Searching online, self-build magazines, home design books, show homes and exhibitions or even snapping photos of similar properties you see and that appeal to you. You may find our blog page helpful as we have completed a number of self-build homes for our clients which have been designed by them. Below are some photos of the homes we have provided the timber frame structures for where the client has self-built. Once you have decided upon a design you wish to take forward, there are some constraints to consider which may restrict your chosen design. Budget – Guide prices for completing a self-built home will give you a better idea of the size and style of house you can afford to build. Using our Self Build Cost Calculator will assist. Restrictions, covenants and development boundaries – you can read more on these on our blog article about Choosing Your Plot for Self Build. Local Planning Council – Speaking to your local planning department about your intentions as they may have restrictions. Health & Safety – Depending on the size and extent of design you decide on for your new home, you may have obligations to adhere to under Health and Safety Law, in particular, CDM (The Construction Design and Management) Regulations 2015. Research – do as much as you can prior to putting pen to paper to know exactly where you stand with the site you have chosen or looking to purchase for your self-build. Sketches for your proposed new build home can be informal and just offering a creative brainstorming stage. Ensure you measure up your plot and use this as a scale for positioning your new build on the land available. Sketch out the floor plans, elevations and sections for the proposed new build, this will give you the opportunity to play around with the layout of the rooms as well as external finishes and where you’d like doors and staircases etc. Planning permission drawings have to be converted into a more detailed, dimensioned/to scale either produced using a computer programme or hand drawn, but ensure these are clear and ruled. Drawings that will be required will be a block plan/site layout showing where the property will sit on the plot. Proposed elevations, floor plans and sections as well as roof plans. You may find that a site survey by a professional surveyor who can identify the site boundaries and produce an accurate site plan for you to work from. You will find that there are additional requirements for planning other than drawings of the proposed home, you may like to download a planning application form which will outline their specific requirements and surveys that may be required prior to breaking soil. 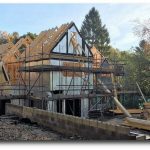 Vision can assist and provide advice to anyone looking to self-build their own home, whether it’s their first or fifth time our experience and knowledge is always on offer to our Client’s, even if non timber frame related! We can be as involved with as much or as little as you require, the beauty of self-build is you are in control. If you have drawings you’ve sketched out (to scale or with dimensions) please send these to us at info@vision-dsl.com and we can certainly provide a cost for the timber frame element for your new build home.